Have you tried the multi-purpose cosmetic yet? MANILA — Get ready to say “I do” to this year’s Marry Me at Marriott happening on Monday night at the Marriott Hotel Manila. As one of the most awaited bridal events of the year, Marry Me at Marriott features the crème de la crème of the local wedding scene. On display are the best of what bridal couture has to offer. 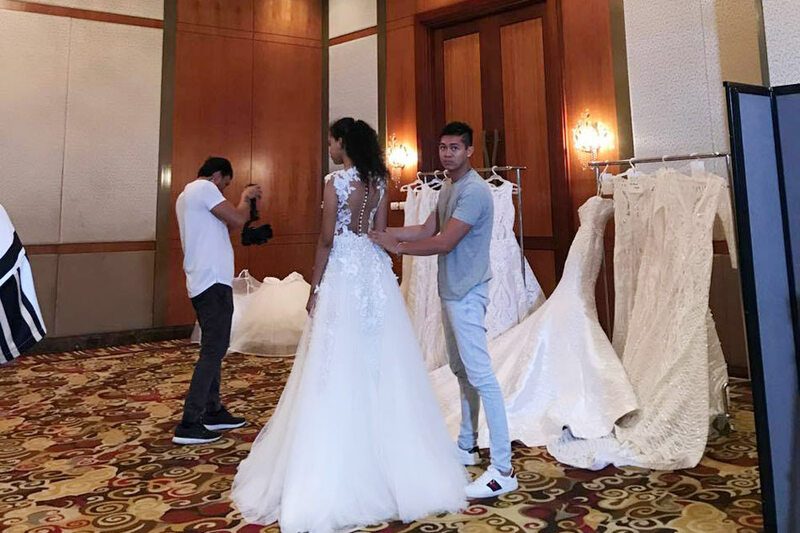 In previous editions, the event showcased the stunning bridal looks of designers such as of Rajo Laurel, Francis Libiran, and Frederick Peralta. For this year’s spectacle, there are four designers in line for the fashion show: Avel Bacudio, Hannah Kong, Happy Andrada, and Michael Leyva. We caught up with the designers during their fittings before the big day to ask them about their inspirations for these highly anticipated bridal collections. Here’s what we’ve found out. Avel Bacudio has not only spent the past two decades dressing Manila’s finest as his brand has also taken the international fashion scene by storm. In 2014, the fashion mogul was handpicked by the legendary shoe designer, Jimmy Choo, to win Mercedes Benz Asia’s Most Influential Designer award. For his new bridal collection, Bacudio envisioned a ready-to-wear line consisting only of separates. Each piece still carries the gorgeous intricacies of a wedding ensemble, but having the possibility of being mixed and matched with other pieces in the collection. Such fun! Bride-to-be Hannah Kong is thrilled to be showing at Marry Me at Marriott. This talented young designer is a protégé at the Ecole Lesage, a school founded by François Lesage whose atelier is currently under the iconic fashion house, Chanel. Hannah Kong piece with her artistic touches of embroidery and beading skills? Right after her shows at the latest F/W Paris Fashion Week and London Fashion Week, Happy Andrada beams with pride as she celebrates her 11th year in the industry. The celebrated female designer is busy with work as she has shows lined up left and right, and even has an exhibit in Paris just days before the show. Her vision for this Marry Me at Marriott collection was to put a modern edge on the romantic bride. With a distinct color palette and several pieces unique to the usual bridal aesthetic, audiences are guaranteed to fall in love all over again. This gifted young designer has already made a mark in the fashion industry by dressing the likes of Anne Curtis and even Kris Aquino for the 2015 SONA and an APEC event as she toured economic leaders around Intramuros. For this collection, Michael Leyva wanted to make a dress for each type of bride. A vision of versatility was key in designing these garments. Whether she may be into beading, lace, embroidery, dainty, structured, or even classical silhouetted pieces, each type of bride will surely realize her fairy-tale coming true as she gets ready to tie the knot on her big day.